I really wanted to get on here and share my gratitude. I have had some pretty incredible experiences in the last few weeks. Which has given me an increased sense of gratitude. Perfect for this time of year to have increased gratitude. *My bed-It reminds me that I have a warm home to come home to. *Holidays-that bring my family together. *Friends-that cover my eyes in the mushy parts of movies. *Perspective-it has changed my life. *A healthy body-I find when my body is in tune my spirit is more receptive. *Light-even the smallest amount of light can bring comfort to a very dark place. *Trials-I have found my greatness through some of my most difficult life experiences. What a fantastic opportunity to have a day a time of year to really reflect on my greatest gifts. I know that none of these things would have been possible without the greatest gift that I have been given. A magnificent Creator that gave me life and the power of choice. I know without my Lord and Savior none of this would be possible. For this I am the most Grateful. Gratitude is a tool I am constantly using in my life. When I'm frustrated or stressed or feeling sad, I start listing all the things I'm grateful for in my life. There is always something to be grateful for, even if it is something small. Once you start seeing the little things you are blessed with you start seeing other larger things you are blessed with. I've seen in my life that the more you express that gratitude for what Heavenly Father has given you, the more he will bless you with! As the end of 2013 is swiftly closing and with Thanksgiving Day here, I have been really thinking about all I'm grateful for and all that I have been blessed with this year. It has been such an amazing year! I've experienced major successes, answers to prayers and MIRACLES! I am so very grateful to be a member of The Church of Jesus Christ of Latter Day Saints! The knowledge I have gained throughout my life of my Savior and God's Plan of Happiness has been a comfort and motivation to me. I am so thankful for my Savior and His Atonement. I have learned so much this year about using the Atonement in my life! I'm thankful for the power of prayer! For many years I've been praying to find an amazing guy to share my life with and this year that prayer was answered beyond anything I could have imagined! I'm so thankful for the better promises my Heavenly Father has for me. They have been worth the wait! I'm thankful for my amazing family! I can't even truly express my gratitude for them. I am truly blessed! My family is always there for me and supporting me on my goals and dreams. They've been there for me in hard times and the best of times in my life. They make me laugh when I really need to laugh. They put up with my bad moods and my crazy ideas. They remind me constantly of the love and service I get to share with others. They are amazing examples of living Christ-like lives! I am truly grateful to call them my family! I am also grateful for the opportunity I have to teach and inspire others both in my work as a teacher and on this blog. It is my hope and prayer that you can take the time each day to count your blessings and see all the good that The Lord has blessed you with in your life. I know that as you do this you will be even more blessed in your life and you will find happiness! A couple weeks ago, I was in my jeep with My-Handsome-Guy-With-the-Killer-Smile. I had Hilary Weeks' album "Say Love" on. I'd listened to it before, but because I wasn't driving, I was able to really concentrate on the words of a song called "Better Promises." My heart filled with a deep love and gratitude towards my Heavenly Father as I listened to the words. In that moment, sitting next to my love with his hand in mine, I took a little trip down memory lane to the path that led me to my very own better promise. From the time I was a small child, I have dreamed of being a wife and mother. It just never worked out for me before. I would come close, but Heavenly Father kept telling me no when I really wanted Him to tell me yes. 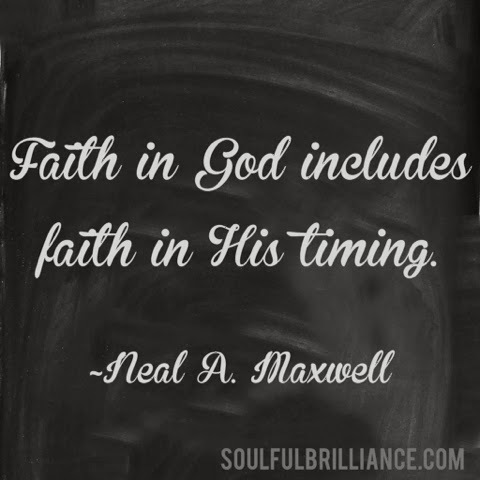 At the time it was hard to keep having faith that things would work out for me. Feelings of loneliness and overwhelming sadness were my constant companions. One day I realized I had just given up. I had taken that dream and pushed it to the back of my mind. I focused on my career and things that weren't really important. I was trying to fill up the place in my heart that was empty. My heart was broken, and I had no idea how to fix it. I remember praying so hard to find a way to be truly happy again. That's when Heavenly Father placed me in the path that led me here to my better promise. That was the first step in my journey of discovering the greatness inside myself and living in my Soulful Brilliance! It's been two and a half years since that first step, and I've had an amazing journey learning so much about life and being happy. I was able to turn to my Heavenly Father in faith and love and allow Him to heal my heart. I am so grateful for the tools I have learned to help me be a happy person no matter what challenges come into my life. I am so grateful for all those hard experiences that have helped me grow and learn and come to the path that led to My-Handsome-Guy-With-the-Killer-Smile! Last week he asked me to marry him:0), reminding me once again that Heavenly Father really does have better promises for us! If I can give to you one gift today, it would be the knowlege that Heavenly Father loves you SO much! He may not answer your prayers the way you would like him to answer them. He may give you some difficult learning opportunities. You may feel all alone and hurting. You may want to give up on your dreams and goals. Just remember and never forget that those experiences are a blessing in disguise. It may take time to see them as blessings, but one day you'll be able to look back and be thankful for the lessons you learned that helped you get to your better promises!